Research to date in sport psychology has mainly focused on the individual athlete and the necessaries they need to achieve expert performance. In doing so, the impact of the (social, emotional, etc.) performance environment in which an athlete prepares and competes is often overlooked. In team sport such as football individuals as well as the team mutually influence team and individual performance. 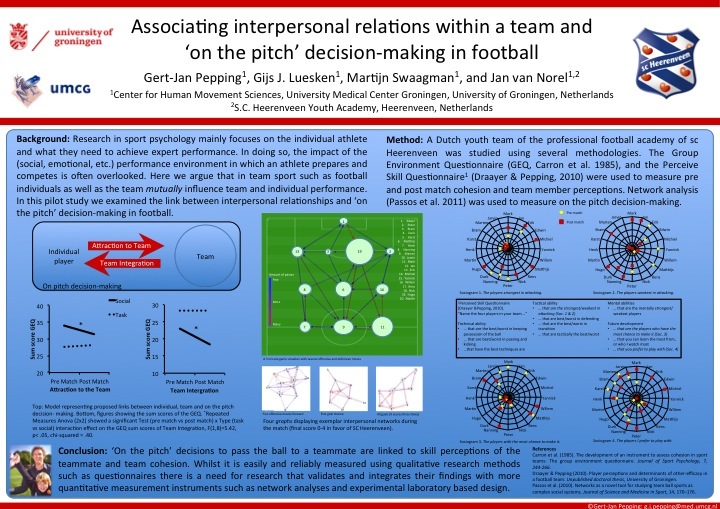 In the current study we examined the influence of interpersonal relationships on decision-making in football. We investigated the relationship between team member perceptions of each other, team cohesion and ‘on the pitch’ decision-making behaviour. Two Dutch youth teams of the professional football academy of s.c. Heerenveen were studied using several methodologies. Questionnaires (Group Environment Questionnaire, and the Perceived Skill Questionnaire) were used to measure team member perceptions and cohesion, whilst notational analysis and experimental laboratory experiments were used to measure implicit and on the pitch decision-making. Results suggest that ‘on the pitch’ decisions to pass the ball to a teammate is linked to skill perceptions of the teammate and team cohesion and visa versa. Data will be presented in terms of an ecological approach to group cohesion and decision-making in football. Team cohesion is and important indicator for team performance. Whilst it is easily and reliably measured using qualitative research methods such as questionnaires there is a need for research that validates and integrates their findings with more quantitative measurement instruments such as notational analyses and experimental laboratory based design.